After the serious mood brought on by that Sun-Saturn Full Moon a couple of weeks ago, I’m relieved to report that this New Moon (October 26) is rather luscious. Especially if you’re trying to have a baby, get deeper into a relationship or plant the seed of a project that emanates from the very depths of your soul. Scorpio is traditionally one of the juicy, fertile signs. With Moon, Sun, Mercury and Venus here right now we’re talking about planting seeds, loving planting seeds, and the actual plantation or implantation thereof. Do it right and in 40 weeks time you may be bringing forth a baby… or a novel… or the apple tree you plant now may be burgeoning. That’s only part of why this New Moon is so very fruity though. Ceres, the goddess of the corn, of fertility, of (in my opinion) making babies is trining (widely) this New Moon from that other juicy, lush water sign, Pisces. And to round off the fertility story, where is the king of the gods, that Lothario and father of numerous demigods? Jupiter is in Taurus, the sign of spring efflorescence, growth, the earth, sensuality. He is exactly opposing the New Moon. Retrograde, it’s true, but that might just mean an old lover and older lover comes roving back into your life. Oppositions suggest enemies and conflict, yes, but also partnering. The lovers Mars and Venus are at passionate odds tomorrow. But if you fight, you have to make up, right. But there is more good news. This New Moon is at a sweet angle to both Neptune-Chiron (trine) and Pluto (sextile). This means that the positive sides of all those planets could be manifested. Idealism and spiritual healing from Neptune-Chiron and the power to transform from Pluto. The only outer planet at an uncomfortable angle to this New Moon is Uranus, the rebel angel, but he is at an exact quincunx, which suggests that he’s not out of the picture, just coming in at a slant. If you don’t feel like getting down and dirty with your darling at this New Moon, please take a still quiet moment to contemplate your own deepest desires. What is it you really, really want? The answer may slide into your mind and surprise you. Juicy post! I’m looking forward to this new moon myself, baby is already on the way, and this moon will fall in my 2nd H so I’m planing to update and advertise more of my work. 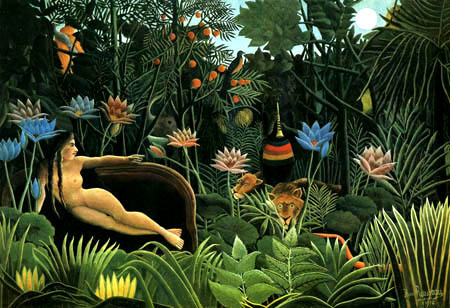 I adore Rousseau, I went to see that wonderful painting when pregnant with my first…Wish you a great new moon! @Good plan – starting new ways of generating income!